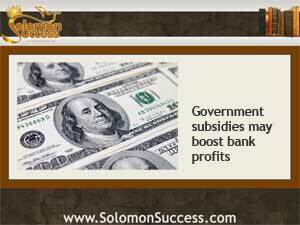 Solomon Success > Blog > Do Government Subsidies Prop Up Big Banks? “He that understandeth shall possess governments,” says King Solomon in Proverbs 1:5. Today, in the string of lawsuits and reforms that have dogged the nation’s biggest banks since the housing collapse of a few years ago, it’s beginning to seem that those banks are using government subsidies for settlements in lawsuits pressed by government entities. A new report from Bloomberg Review notes that the eight largest banks in the US earned over $80 billion in 2013. That number includes perennial bad boys Bank of America and JP Morgan Chase, along with Citibank and a few smaller institutions involved in lower profile legal issues. The primary way that banks make their money is through borrowing at lower interest rates than they can earn from their assets. That borrowing is conducted between both domestic and foreign banks, and those rates stay low because the debt is guaranteed by the government. In other words, if banks are unable to meet their loan obligations, government support keeps them afloat. The financial crisis and subsequent housing market collapse of a few years ago put these massive banking operations in the public eye. As the subprime loans they’d underwritten crashed and the shady banking practices associated with them hit the spotlight, so did the government bailouts. Those government-backed bailouts continue even as more lawsuits are pressed against the big banks – by the government. Investigations and charges against Bank of America, JP Morgan Chase and others have been conducted by the US Department of Justice and a long list of states’ attorneys general, among others. And nearly all of those cases have resulted in a settlement from the institution in question. Those banks, which together were responsible for billions in transactions and the bulk of the nation’s lending activity, were quickly deemed “too big to fail” – so big, in other words, that to fall into insolvency would create an even bigger financial disaster. And that meant that they had to be supported at any cost. That cost ended up being carried by the nation’s taxpayers, who by some estimates subsidize at least a quarter of the banks’ profits. Other figures place that total much higher, suggesting that these institutions actually “make” most of their money from subsidies rather than actual earnings. The well publicized problems in the nation’s banking industry and the legal actions that followed led to a spate of new regulations under the sweeping Dodd Frank Act, which was aimed at imposing accountability on the banking industry and protecting consumers. But according to some financial experts, the provisions of Dodd Frank may have had the unintended consequences of pumping more money into the big banks through higher interest rates, fees and charges to customers.